It’s easy to share the gift of membership with a friend or family member! 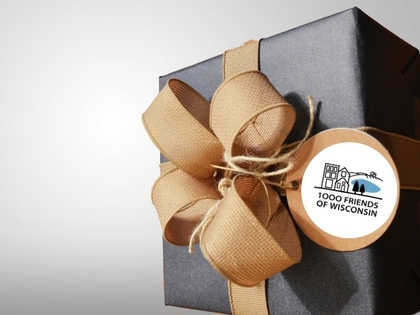 All you need to do is make a tax-deductible contribution to 1000 Friends of Wisconsin and include the name and contact information for the gift recipient. It’s a great holiday gift idea that really makes a difference! Honor someone special with a tribute or memorial gift. Honor your friend or loved one with gift to 1000 Friends of Wisconsin and help us make protect natural areas and promote healthy communities. Make a tax-deductible gift to 1000 Friends and we will send a letter with your personal message and you will receive an acknowledgement of the gift for tax purposes. This is a special means to celebrate a life event or to honor someone’s memory.